There are typically two kinds of ex-Bengals. Most hightail it out of town the minute their contracts or playing days are over; a few stick around well after roars from The Jungle fade into memory. Cris Collinsworth is that second kind. After playing wide receiver in the 1980s on Cincinnati’s only two Super Bowl squads, No. 80 did more than just put down roots in Northern Kentucky. The 6-foot-4 star known for his good nature, crisp routes, and sticky hands dug into the local community through charity work, investments, and endorsement deals with Western & Southern Financial Group and Camargo Cadillac, among others, while building a national presence as network TV’s preeminent NFL analyst. A recent out-of-nowhere third act, though, might well surpass his Bengals championship seasons and a trophy shelf packed with 16 Sports Emmy Awards. “It was probably a defensive play as much as anything else,” says the legendarily amiable Collinsworth, whose razor-sharp insight into the game for NBC’s Sunday Night Football over the past nine years has grown noticeably more focused even as memories of his 1,000-yard receiving seasons fade into the record books. You don’t have to be a sports fanatic to understand that easily accessible online, drop-down menu statistics are the new Xs and Os for football teams and fans. In the same way that sabermetrics has forever changed the way Major League Baseball teams view player performance, Pro Football Focus has quickly become the leading method of rating and ranking NFL players based on the company’s patent-pending -2 to +2 grading system. Any player, any game, any statistic you could possibly want is now available at the click of a mouse, and PFF is happy to provide it for a reasonable annual fee. Surrounded by a handful of oversized pictures of Collinsworth in his Bengals heyday, Hornsby shares his origin story in a high-ceilinged, white-walled space that looks like a tony design/photography studio—which it was in a previous life—decorated by a football obsessive. Just outside the door, more than a dozen IT and analytics staffers in office casual jeans, shorts, and T-shirts stare silently at their screens, chairs draped in jerseys amid artfully scattered memorabilia from Collinsworth’s college, pro, and TV careers. PFF signed up 13 NFL franchises by 2014 and was bringing in nearly $1 million in revenue a year when Collinsworth unexpectedly e-mailed. Already familiar with the three-time Pro Bowler’s football résumé—and aware that he’d bought a $26.99-a-year subscription—Hornsby was thrilled to learn in a subsequent phone conversation that Collinsworth was looking for exactly the kind of analysis PFF provided, even if his initial response was less than enthusiastic. Collinsworth photographed with Neil Hornsby in the Pro Football Focus offices July 12, 2018. The way Collinsworth remembers it—still amused at how far the two have come—reaching out to PFF via e-mail was like trying to locate the Wizard of Oz. In need of an efficient way to prep for NBC’s then-new post-game show without having to watch every minute of every Sunday contest, he jokes that he had “steam coming out of my ears” when he heard Hornsby’s English accent. 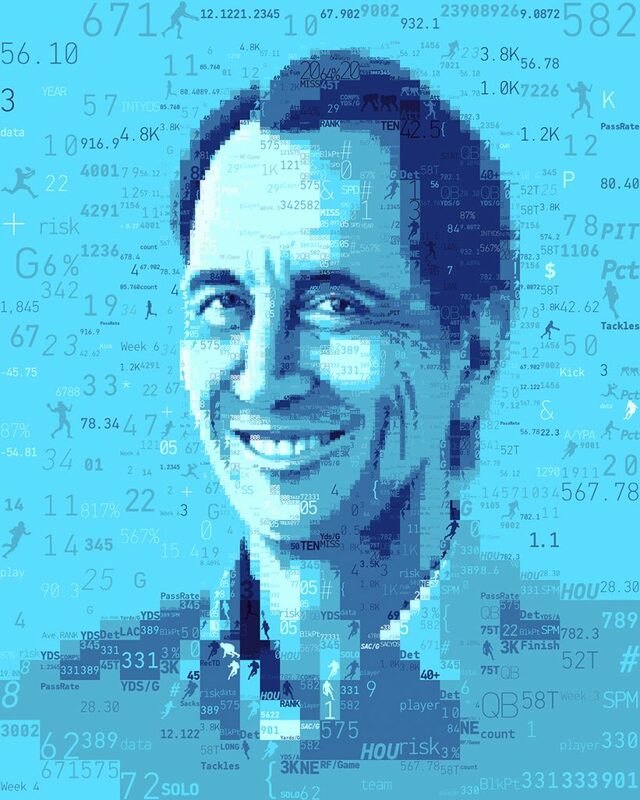 Confident that he’d been duped by a Transatlantic flim-flam man and thrown $27 out the window, Collinsworth hit Hornsby with a rapid-fire burst of arcane football questions—which the man behind the curtain matched stat-for-stat, blowing past even Collinsworth’s deep football knowledge. A week later, Collinsworth made an offer to buy a majority stake in the company. It was a tough decision for Hornsby, the father of four boys, who calls Pro Football Focus the daughter he never had, but he was convinced he’d finally found the partner who could take PFF to a new level. “However good I thought Cris was going to be, however much pride I thought he would take in PFF, however decent a boss I thought he would be, he’s exceeding my expectations in every capacity,” says Hornsby. “Cris has that ability to listen to people at all levels of the business and make them feel involved.” He credits Collinsworth’s listening skills to his years of talking to fellow NFL players and coaches and picking their brains, as well as an integrity tied to doing the right thing instead of chasing the biggest payday. Listening to the men describe each other’s complementary strengths brings to mind Collinsworth’s connection to former Bengals quarterbacks Ken Anderson and Boomer Esiason. There’s an unspoken language between a wide receiver and the team’s offensive leader, and these two men appear to have replicated that crucial trust as they work side-by-side in PFF’s offices. Hornsby praises Collinsworth’s innate business mind and keen ability to read a room, while the ex-Bengal—whose inviting, unhurried speaking manner hints at a certainty born of thoughtful deliberation mixed with a reassuring confidence—is similarly effusive. Collinsworth knows that PFF’s proprietary data, day-to-day management, and product quirks are safe in Hornsby’s hands. And they’re crystal clear about Cincinnati being absolutely the best place from which to launch their blitz on the digital sports world. Born in January 1959 just outside of Dayton, Ohio—his father Abraham Lincoln Collinsworth taught and coached football and baseball at Kings High School—Collinsworth’s family pulled up roots and moved to Florida when he was 4. He now spends six months a year in the state to be close to his daughter and new granddaughter, who live half a mile from the train station that deposited him in the Sunshine State all those years ago. After racking up three all-SEC first-team selections playing college ball for the University of Florida, Collinsworth was drafted by the Bengals in the second round in 1981. “I remember driving my Mercury Bobcat to training camp and coming down the cut in the hill on I-75 for the first time and seeing the bridges and the city revealed and almost being overwhelmed,” he says, his voice wistful as he recalls the rush of adrenaline he felt that first time he caught sight of the downtown skyline. Once Collinsworth worked his magic on Hornsby—who moved here in 2014—the two set out to find a home base for PFF. 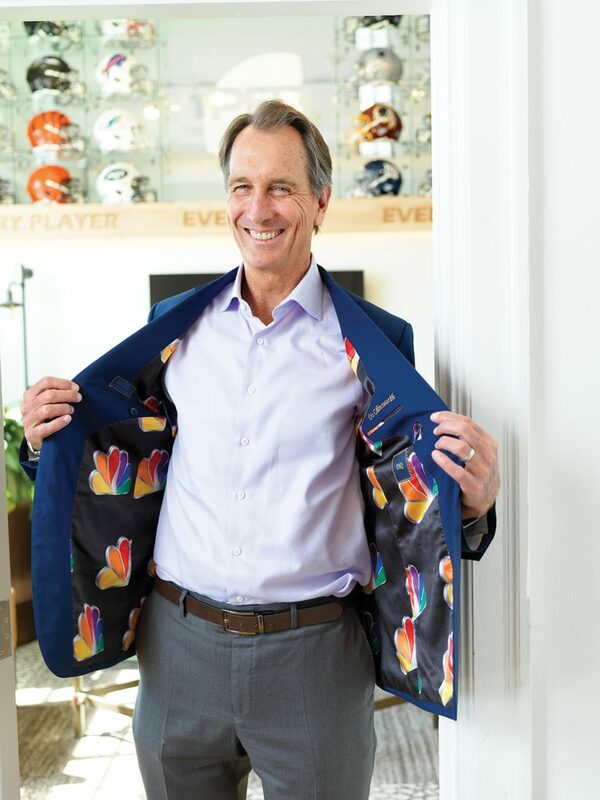 They originally rented office space just east of Vine Street in Over-the-Rhine, where Collinsworth noticed that his staffers loved walking to restaurants and shops in the “hip and cool” surrounding neighborhood. 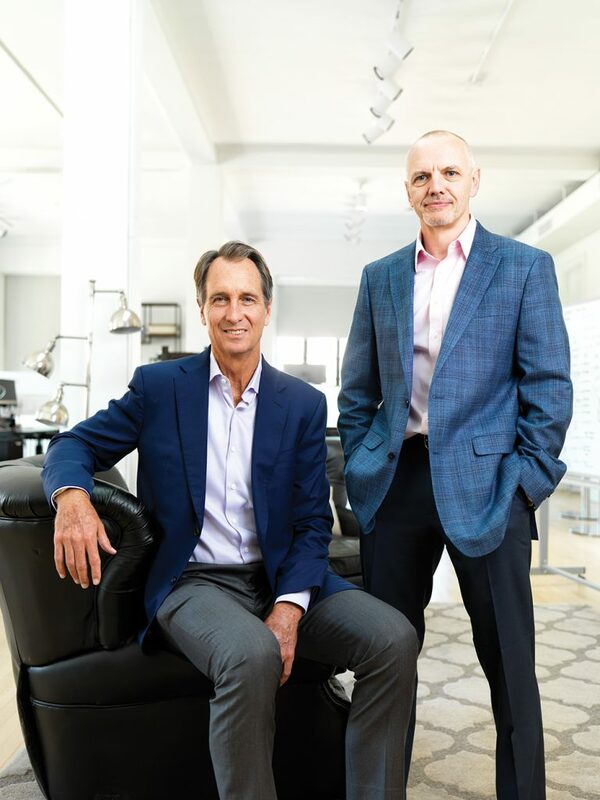 After outgrowing that office, he was convinced to check out a 6,000-square-foot building bought by his longtime ProScan Imaging business partner Stephen Pomeranz, M.D. His wife, Penny, envisioned fixing it up to host kids’ programs tied to Collinsworth’s ProScan Fund. In person, Collinsworth is everything you’ve heard and read about him. Holding the front door open for visitors from the American Cancer Society as they exit (and doing the same for this writer a short time later), he moves with big man deliberateness up the refinished blonde wood stairs of the two-story brick building. Like Collinsworth, Hornsby was sold right away on Over-the-Rhine’s central location, walkability, and eclectic mix of neighbors, which reminded him of London’s diversity back home. Plus, things will get a lot more interesting when FC Cincinnati’s soccer stadium is built just down Central Parkway, a development that could mean yet another expansion for a business that’s already grown beyond either man’s wildest expectations. After moving into its new home in summer 2017, Pro Football Focus joined a growing cadre of tech start-ups in OTR, providing yet another incentive for coveted young professionals to follow Hornsby’s lead and take a runner at moving to Cincinnati to make their future now. “Cris’s decision speaks volumes about the vibrancy and future of our region, and validates our efforts to create a renaissance that drives business expansion, talent retention/attraction, and visitors,” says Julie Calvert, the recently installed CEO of Cincinnati USA Convention & Visitors Bureau. PFF currently has 30 staffers on site in OTR and, by the time the NFL season opens this month, will have more than 500 around the country and overseas. The local mix includes native Californians, a CTO brought over from England, a professor of mathematics from Wisconsin who does predictive analytics, and another analyst from Washington, D.C.
Former Chicago Bears great Mark Carrier first got wind of PFF when he was a defensive backs coach for the Bengals from 2012 to 2016. After leaving the team, he was contacted by Hornsby, who was looking for someone with Carrier’s experience to help other former NFL players who analyze film for PFF. “As a defensive backs coach I understand that analytics is a big deal, especially with offenses looking to get an edge,” says Carrier, who stayed in the city after his kids’ graduation from high school and began working part-time at PFF in 2017. At one point, Hornsby excuses himself to take a call from the firm’s “No. 1 customer,” NBC’s NFL executive producer Fred Gaudelli. The chat is about a trip Gaudelli was planning to bring part of his team to PFF’s offices for a “shock and awe” presentation of the company’s predictive analytics work for the NFL, which will be amped up another notch this season. When Collinsworth sits down at his desk for a run through the bells and whistles the league gets for its considerable investment, a few clicks quickly take him through a bottomless trove of data on every player and position stat you might ever want. Despite his good-natured protestations about how his IT team won’t let him see the latest version, Collinsworth dials up half a dozen film clips that allow his crew and NFL coaches to analyze games from every conceivable angle in one-third of the time it takes to actually play a regulation game. As of early 2018, in addition to every NFL team, PFF was working with 40 top-tier college programs and had deals with NBC, CBS, Fox, ESPN, and the PAC-12 Network. NBC, of course, isn’t buying the standard $39.99-a-year package (or the $199.99-a-year Elite plan for deep-dive gamblers and fantasy fanatics), but a highly specialized bundle of information aimed at boiling down mountains of data into useful bits for its broadcast team and for fans watching at home. Which is why, every Monday before NBC’s Sunday Night Football contest, PFF sends Gaudelli 80-page scouting profiles of both teams. Given the company’s quick rise, the OTR office might be just another way station. PFF currently crunches numbers from 267 NFL regular season and 65 preseason games per year, plus 870 major college games and, as part of a pilot program, 500 high school games. It’s also started going back to 2011 to evaluate college games by current NFL players in order to provide more complete data sets. Asked about the Supreme Court’s ruling allowing states to legalize gambling, Collinsworth’s smile breaks wide. “They want every single thing we can give them,” he says of gamblers hungry for an edge. PFF is a well-oiled machine that both men hint could grow larger as they add more tiers of football along with other sports that have been kicking the tires. “I’m recruiting like you’d recruit college athletes, putting them in Neil’s lap. We have a couple things that, if they happen, it’s entirely possible we could have to double in size again in the next year,” Collinsworth says with a cagey grin. At a recent company happy hour, Hornsby says a number of people came up to thank him for bringing PFF to Cincinnati. “Cris brought it, I didn’t,” he clarified. With late afternoon sunlight pouring in from a big window overlooking Central Parkway hitting the silver frame of a black-and-white photo of his father that hangs under an action shot from his Bengals days, Collinsworth does what a team player is supposed to: He shares the credit. “I always thought that if you employed one person you were a real American hero,” he says. “Because you’re not only taking care of your family, but also another family. But if you employ 100 people, you’re 100 times an American hero.” Collinsworth doesn’t see himself as a hero, though. Just a guy with who saw a wide-open opportunity, hauled it in, and is running with it as far as he can.